Reading and share top 7 famous quotes and sayings about Noldor by famous authors and people. Browse top 7 famous quotes and sayings about Noldor by most favorite authors. 1. "Thus died Fingolfin, High King of the Noldor, most proud and valiant of the Elven-kings of old." 2. 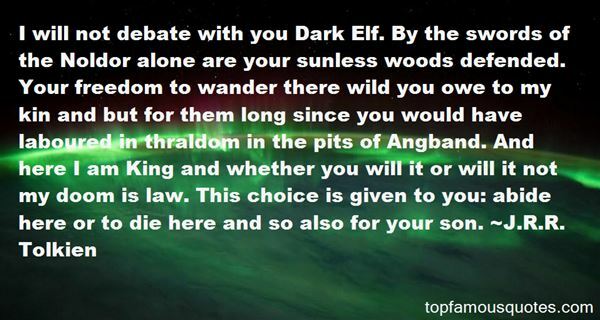 "I will not debate with you Dark Elf. By the swords of the Noldor alone are your sunless woods defended. Your freedom to wander there wild you owe to my kin and but for them long since you would have laboured in thraldom in the pits of Angband. And here I am King and whether you will it or will it not my doom is law. This choice is given to you: abide here or to die here and so also for your son." 3. "Love not too well the work of thy hands and the devices of thy heart; and remember that the true hope of the Noldor lieth in the West, and cometh from the Sea." 4. "You renounce your friendship even in the hour of our need ' he said. 'Yet you were glad indeed to receive our aid when you came at last to these shores fainthearted loiterers and well-nigh emptyhanded. In huts on the beaches would you be dwelling still had not the Noldor carved out your haven and toiled upon your walls." 5. "At last Fingon stood alone with his guard dead about him; and he fought with Gothmog, until another Balrog came behind and cast a thong of fire about him. 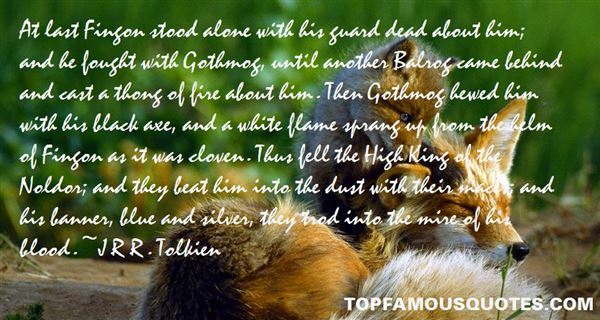 Then Gothmog hewed him with his black axe, and a white flame sprang up from the helm of Fingon as it was cloven. Thus fell the High King of the Noldor; and they beat him into the dust with their maces; and his banner, blue and silver, they trod into the mire of his blood." 6. "For suddenly above him far and faint his song was taken up, and a voice answering called to him. Maedhros it was that sang amid his torment. But Fingon climbed to the foot of the precipice where his kinsman hung; and then he could go no farther, and he wept when he saw the cruel device of Morgoth. Maedhros therefore, being in anguish without hope, begged Fingon to shoot him with his bow; and Fingon strung an arrow, and bent his bow. And seeing no better hope he cried to Manwe, saying: 'O King to whom birds are dear, speed now this feathered shaft, and recall some pity for the Noldor in their need! 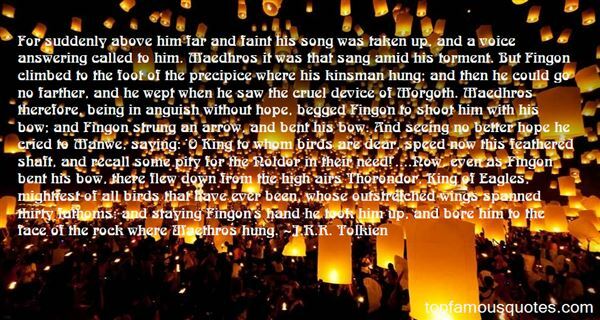 '....Now, even as Fingon bent his bow, there flew down from the high airs Thorondor, King of Eagles, mightiest of all birds that have ever been, whose outstretched wings spanned thirty fathoms; and staying Fingon's hand he took him up, and bore him to the face of the rock where Maethros hung." 7. "Maedhros laughed saying: 'A king is he that can hold his own or else his title is vain. Thingol does but grant us lands where his power does not run. Indeed Doriath alone would be his realm this day but for the coming of the Noldor. Therefore in Doriath let him reign and be glad that he has the sons of Finwe for his neighbours not the Orcs of Morgoth that we found." There you go, lads, definitive proof that it isn't who you know that matters, but who you know they've been shagging."